I started with the recipe from The New York Times that I had mentioned in an earlier post–and adapted it for single-serving cooking. My first “adaptation” was NOT to buy a whole head of cauliflower–I like it but I usually waste some of it, so I purchased 250 grams from the salad bar at my local Harris Teeter store already cut. This was about 1/4 of what the original recipe called for (900 to 1000 grams). My second adaptation was to use the rice cooker to blanch the cauliflower! Put water in, add salt, close the lid and set the “rice cooker” mode. In just a few minutes when I opened the lid I had boiling water. 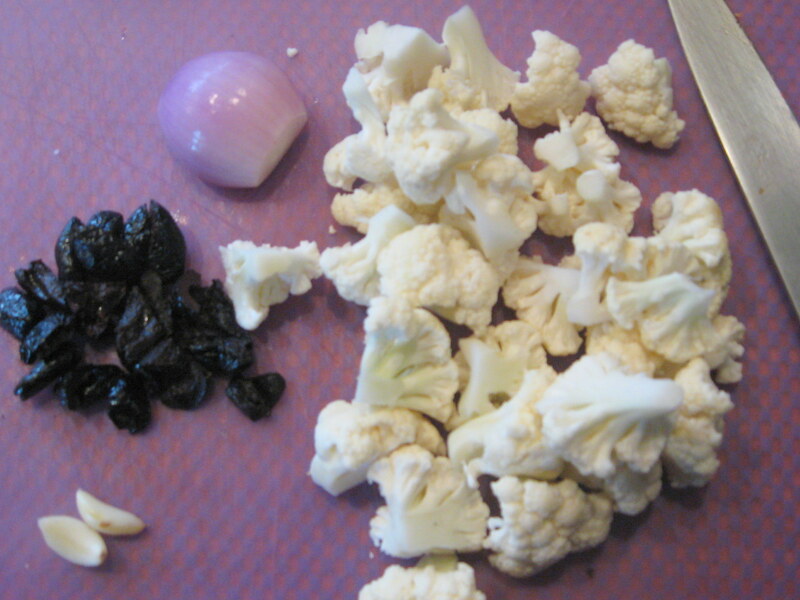 I added the cauliflower, close the lid and blanched for about 5 minutes, then proceeded with the recipe–faster than a pan of water on the stove top! My third adaptation is one I use often in cooking for one–I used shallot instead of onion since I don’t like bits and pieces of cut onion loitering in the fridge–so one medium to large shallot, prepped as for the onion in the above recipe. That recipe called for 16 olives–well four olives just didn’t look like enough, so I used six. Garlic–well, I used two very small cloves. 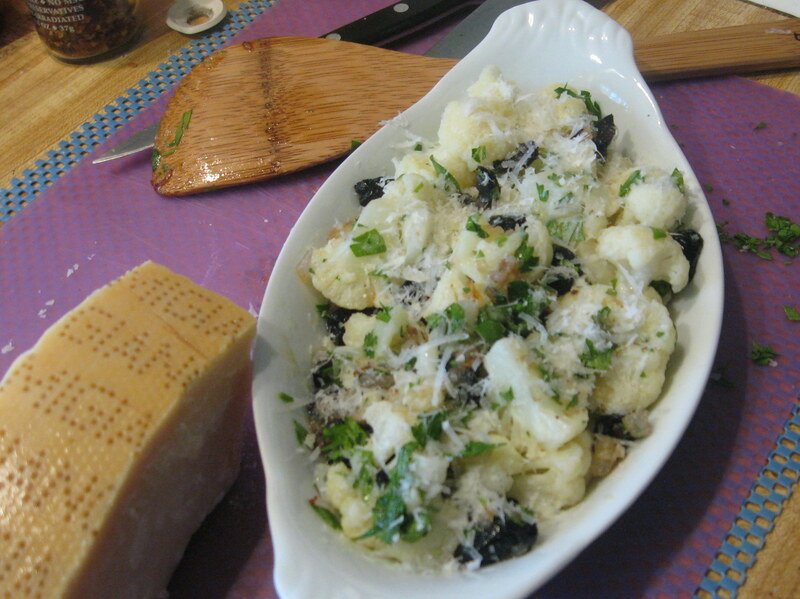 The rest of the ingredients were “measured” by eye: parsley, the Parmigiano-Reggiano were whatever looked like enough for the amount of cauliflower–maybe my adaptation is a bit cheesier than the original, but that’s okay with me! The results were fantastic, maybe even awesome! (Please note past tense–well, there was a tiny bit left, but that’s probably because of the rather large cod fillet–a leftover as I define leftovers–re-warmed in sugo alla puttanesca.) This was one of the best things that I’ve ever done with cauliflower. It’s a keeper with lots of room to improvise: some red pepper flakes added to the shallot-olive mixture, or maybe some roasted red peppers. 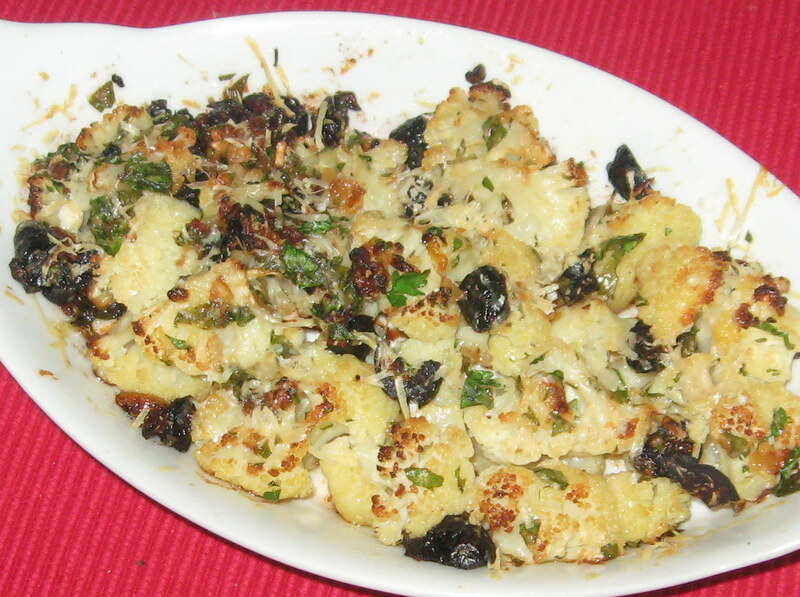 I think that I might step down to 150 grams of cauliflower next time, and bake it in a slightly deeper dish–but it will definitely be made again. I do need to add more garlic, though. I can’t believe how easy it was. This is my kind of recipe–not at all fussy and open to modification to fit my mood, the weather, and what else is served. The cod fillet was a “leftover”–meaning planned. The method of the “rerun” was unplanned. After several days of intensive course preparation for online courses, I suffered a serious case of cabin fever. On impulse, I called a friend, and we went out to dinner at one of my favorite causal places, Meelo’s Ristorante, here in Durham, since I had a serious craving for Andre Chabaneix’s spagetti alla puttanesca. There was a bit of the puttanesca sauce left in the bottom of my plate, so I brought it home with me. I used it to gently re-warm the cod fillet for supper this evening–now I’m going to have to see if I can match his sauce so that I don’t have to go out every time I want puttanesca sauce.